OCR Won't recognize Steam keys (Dot Matrix OCR) - OCR.space Free OCR API - Forum for Kantu Task and Test Automation and the free OCR API. EDIT: Resized image (50% of original size) did work on google vision API but I don’t want to use that one. For alphanumeric OCR it can be always helpful to experiment with different OCR languages. Thanks a lot for a reply. I have tried following that article and it did help a bit. I’ve processed Images both in Photoshop and Python. Output was ofcourse not the same. Both pictures got recognized at Google Vision API, but OCR.Space did fail a bit. 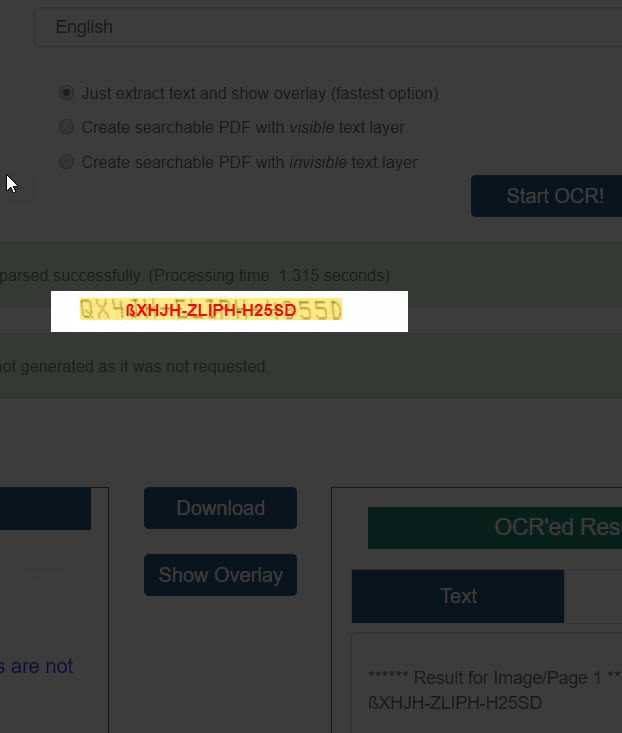 Also I’ve tried running tesseract OCR on images and output from Photoshop achived around 70% accuracy. I think I’ll have to get more train data for tesseract or to improve processing of image for ocr.space api which is my ideal solution.